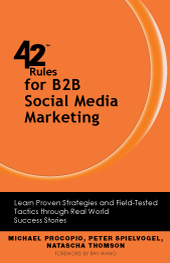 42 Rules for B2B Social Media Marketing - If you want to remain relevant as a marketing professional, read this book! Social media is changing the way people think about marketing. It’s much more than pushing out the same content through new channels. The biggest shift is that communications is now bi-directional; you can (and must) listen to your customers rather than just talking to (at) them. Social media practitioners Michael Procopio, Peter Spielvogel, and Natascha Thomson share their combined 20 years of hands-on social media experience, explaining how to understand market requirements, engage in conversations with your customers, build awareness for your solutions, and generate targeted leads. Using a combination of proven best practices and real-world stories, they describe how to maximize your return on investment with Facebook, YouTube, LinkedIn, and other popular online channels. "This book is a must-read for your staff to learn key B2B social media marketing strategies and fill in knowledge gaps. It provides hands-on advice and real-world use cases, unlike many other books on the topic that talk high-level and leave people wanting. Whether you want to build your brand online or turn your organization into a social business, as an executive, this book is a great resource." "Social marketing advice today is predominantly geared to B2C organizations which are fundamentally different from the B2B world. Yet, we know that business-to-business commerce and interactions can benefit greatly from social business practices, and that B2B organizations can have exponential impacts on the global marketplace. "42 Rules" offers valuable, practical guidance for B2B marketers at all levels. The content is well organized for easy reference, includes quick ideas to implement, and is supported by real-world examples." Social media is changing the way people think about marketing. It’s much more than pushing out the same content through new channels. The biggest shift is that communications is now bi-directional; you can (and must) listen to your customers rather than just talking to (at) them. But, with so many social media channels and new rules of engagement, even seasoned marketing professionals sometimes get stuck on where to begin. This book was created for business-to-business (B2B) marketing professionals who need to move quickly towards a marketing mix that now includes social media. While there are many books on social media marketing, there are few that focus on B2B. While B2B marketing is still the commonly used term to differentiate it from business-to-consumer (B2C) marketing, social media – and the future of marketing - is about people-to-people (P2P) communications. In this book, social media practitioners Michael Procopio, Peter Spielvogel, and Natascha Thomson share their combined 20 years of hands-on social media experience explaining how you can best leverage social media for your business. Learn how to understand market requirements, engage in conversations with your customers, build awareness for your solutions, and generate targeted leads with social media. Using a combination of proven best practices and real-world stories, the authors describe how to maximize your return on investment with Facebook, YouTube, LinkedIn, and other popular online channels. The focus is on how to engage more effectively with your customers and prospects using social media. The phased approach used in the book enables you to make steady progress as you move into social media without getting overwhelmed by too many options. Instead, the book makes it easy to integrate what you learn into your existing marketing strategy and day-to-day execution, step by step, while avoiding classic mistakes like over-committing resources. Providing small and well-defined chunks, this book will help you define what is right for your business, as taking on too much has caused many failures. If you want to remain relevant as a marketing professional and avoid common mistakes, read this book. 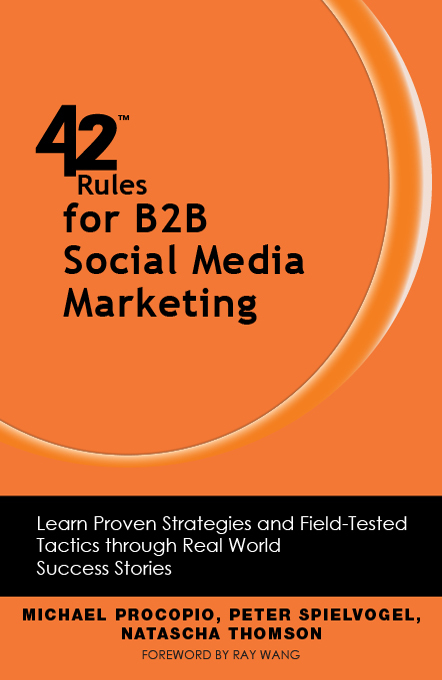 Want a branded edition of 42 Rules for B2B Social Media Marketing? "This is a book written by B2B digital and social media practitioners for B2B digital and social media practitioners; the level of detail and comprehension of the differences—and similarities—between markets is impressive. A must-read for those responsible for digital and social program execution within progressive B2B organizations." Michael Procopio has more than 25 years experience in high-tech organizations as a business leader and technology and marketing manager. As a social media strategist in HP's Social Intelligence Services, he consults with Fortune 1000 customers on social media and social intelligence. Previously he managed HP Software's overall social media presence and direction where a social media lead gen activity yielded a 2500+% ROI. In addition to his regular duties, Michael teaches social media to various groups inside HP and publishes a newsletter. Michael speaks internationally about social media and is a member of the Society for New Communications Research, the HP Digital Marketing Council, IEEE, and is a trained HP Wikipedian. Michael holds a BS in Computer Science and Electrical Engineering from California State University, Long Beach. He resides along California’s Central Coast. Peter Spielvogel has been a high-tech marketing executive since the early 1990s and a business-to-business social media practitioner since 2005. Peter uses social media extensively to understand market requirements, build awareness among current and future customers, engage in online discussions, promote events, and generate targeted leads. He leverages wikis to share fresh content among marketing, sales, product management, and various technical teams. In his current role at SAP, he provides product marketing and product management expertise to a customer-focused development group. Previously, at HP, he led a global product marketing team. Prior to HP, he held executive-level marketing roles at several startup companies. Peter’s education includes an MBA from the Tuck School of Business at Dartmouth and a BS in Engineering from Princeton University. He is based in Silicon Valley, California. Natascha Thomson has over 15 years experience in B2B marketing with a focus on using social media to connect people for business since 2007. She is the founder and owner of MarketingXLerator, a B2B Social Media Marketing Consultancy. In this role, she is able to draw from her background in online community marketing, competitive intelligence, partner marketing, analyst relations, product marketing, and product management. Most recently, as an executive at SAP, Natascha provided social media consulting and training for SAP organizations, including strategy development and ROI measurement. She has worked in Europe and the USA at startups and large corporations, including HP and EMC. Natascha’s education includes an Executive MBA from St. Mary's College of California, and a Master of Commerce and Arts from the University of Passau, Germany. She lives in Silicon Valley, California.